For companies that do not have a punch clock to ring start of shift or lunch and coffee breaks we have a line of programmable timers which can handle any switching arrangement. In most industrial locations there are multiple shift START/END times with different schedules depending on the day of week, our timers can have up to 400 events per day with a different bell schedule for every day of the week. Our digital timers are truly the most FLEXIBLE 7 day 365 day timers available, if you require a bell or signal to ring automatically at pre-determined times, then our full range of digital bell timers will provide your company with the most flexibility and convenience of any timers available today, we also carry 2 and 4 circuit models for companies that want to switch more than 1 circuit at a time. MC 100 master clock system runs up to 50 clocks and bells off of single zone. Easy to use, “plug & play” low voltage system—requires minimal set up time and little if any electrical support. The system can support up to 300 eventsper day and is expandable to 4 bell zones. This system includes a Master clock terminal, software, 50' cable, mounting bracket, and an instruction manual. 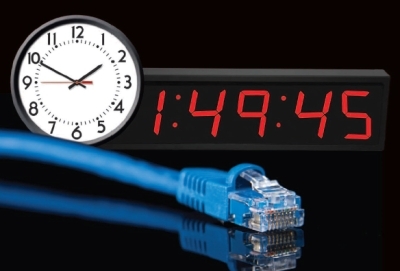 We have a ethernet-based master clock control for your digital display clocks and bell ringer. You no longer need to use an outdated time clock to sound your break buzzers. 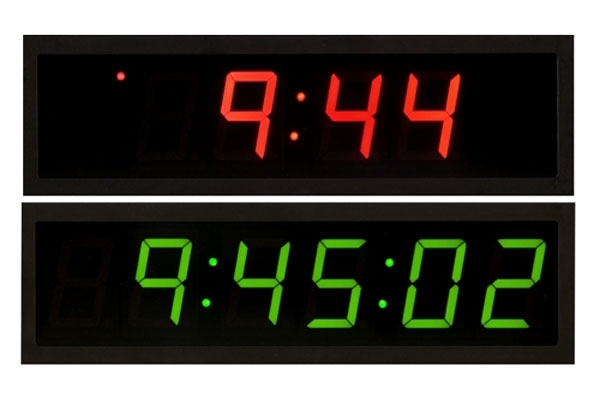 Our pc-based solution allows for total synchronization of your horns, digital clocks or analog wall clocks to your computer network. Imagine having all of your employees working on the same synchronized network, all of your bells ringing simultaneously as your analog wall clocks strike 5:00 PM! This is now an affordable reality and it is all available with a simple connection to your network! NO Software Required! Power over Ethernet clocks —also known as IP network clocks, Ethernet clocks and NTP clocks—are today’s standard in synchronized time, delivering both power and time updates through one cable connected to your facility’s Ethernet. Clocks are equipped with programmable relay for control of external bell. Relay is easily programmed from any computer on your network. 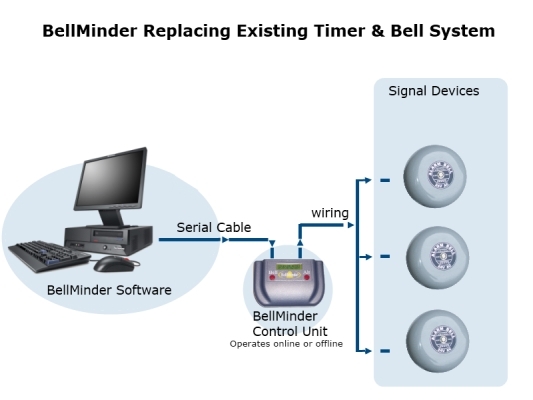 BellMinder is a fully automatic school bell system that is used to solve the common daily problem of ringing a bell on time every time and only when required. Unlike other School Bell Systems on the market, BellMinder is a custom developed School Bell System specifically designed for automating school bells, from the most basic schedules to the most complex. A full year time schedule can be implemented in minutes and schedule changes in seconds.